The Glasilium vase: round glass combined with rugged cork and dazzling copper. We love it - and hopefully you do too! The clear glass of the Glasilium vase allows a single flower to shine, from the bottom of the stem to the highest petal. The vase allows you to enjoy the small things in daily life, which is precisely what designer Eva Levin intended. She started her company Scandinaviaform in 2014 after studying Silversmithing & Design at Folk University in Lund, Sweden. Eva explains: “Often we no longer see how every flower is a wonder of nature and how stylish flowers are. With these vases I am trying to hang on to that sense of marvel at nature. With Glasilium you bring nature indoors and display flowers in all their beauty." 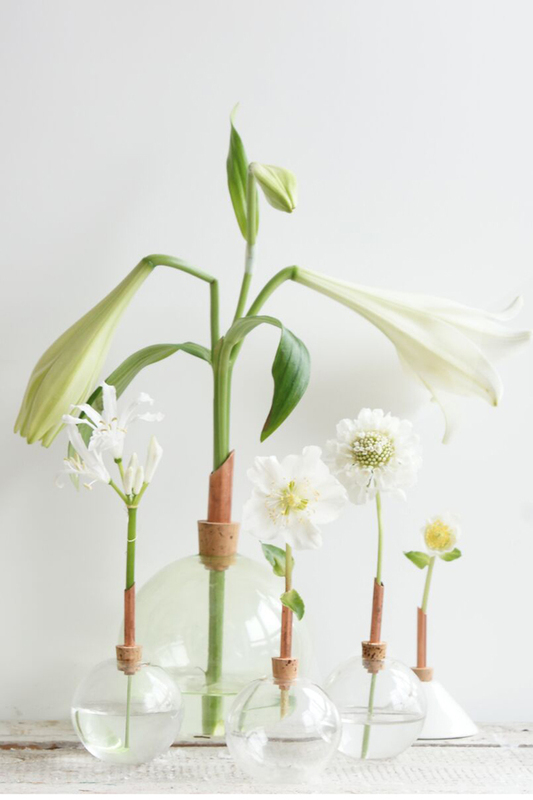 The vase works particularly well with individual flowers with a slim stem, such as Gloriosa, Gypsophila or Fritillaria in spring. These are modest types that can show off everything nature has given them in the Glasilium vase.